The Festival of the Lion King is a 30-minute immersive Broadway-style performance based on the 1994 film. It features four singers, characters, costumed dancers, and specialized performers in acrobatics, fire spinning and more. The show takes place hourly throughout most of the day at Disney’s Animal Kingdom. Why Purchase a Package? Festival of the Lion King is a popular show and most showings will fill up. The Dining Package includes priority reserved seating for a performance (with a commemorative cast photo) and includes either lunch or dinner at Tiffins. 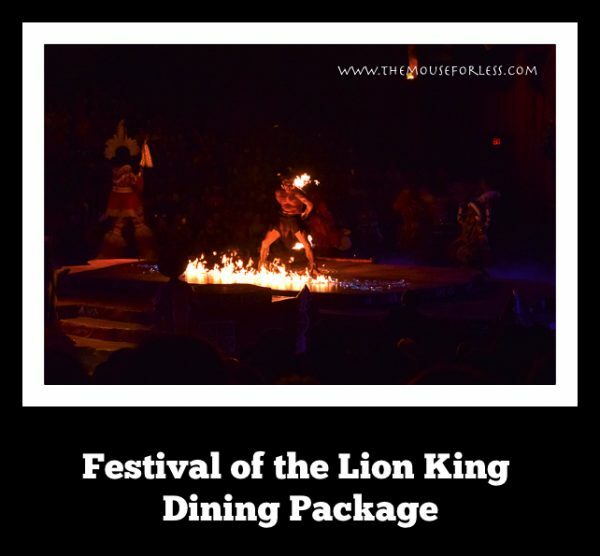 When you purchase a Festival of the Lion King Dining Package, you can avoid lengthy standing in lines or using a FastPass and still ensure that you will have an excellent seat. Making Reservations: The Festival of the Lion King Dining Package includes a meal reservation plus a seating voucher. Currently, “tiered” pricing for the Dining Package is offered at Tiffins. While there is no additional charge beyond buying your meal for the package, you must guarantee it with a credit card when reserving. Your card is not charged at the time of reserving, but a $10 cancellation fee will be applied to your card if the package is not canceled at least 48 hours prior to restaurant seating time. After dining, pay for your meal with cash, credit card, room charge or Dining Plan credit(s). Call (407) WDW-DINE (939-3463) up to 180 days in advance to make Advance Dining Reservations. The Festival of the Lion King Dining Package is also available to book through Disney’s Online Reservation System. Space is limited so advance booking is highly recommended. How it Works: Arrive at your selected restaurant and dine. You will be given a special pass after your meal that will admit you to the reserve seating section in the Festival of the Lion King theater. There is no charge for this pass and charges apply only to your pre-priced dinner. At least 15 minutes prior to show time, enter the theater with your pass and a Cast Member will direct you to the reserved seating section. You should enter the theater from the exit. If you enter later than 15 minutes prior to show time, you may lose your reserve seating as extra seating in this section is then offered to the general public. If a show is canceled due to inclement weather, you will receive guaranteed seating for an alternative performance within 5 days. Special for Tier One: Guests reserving the “Tier One” dining package will be upgraded to VIP seating for the festival of the Lion King performance, and will also receive a private guided safari tour following the performance. Dates: Dining packages are offered daily from August 13 through November 21, 2018. Prices listed do not include tax or gratuities. Tiffins celebrates the art of traveling, featuring foods from places around the globe that inspired the creation of Disney’s Animal Kingdom. With beautiful waterfront views, this 252-seat high-end restaurant is the signature restaurant at Disney’s Animal Kingdom. Appetizers like charred octopus, spiced chickpea falafel or avocado-and-tomato salad are a great way to kick off the feast. For your main course, select from variety of mouthwatering options such as pan-seared Alaskan halibut, pomegranate-lacquered chicken or Wagyu rib eye, to name a few. Save some room for one of our decadent desserts—guava mousse, South American chocolate ganache, whipped cheesecake and other delish dishes sure to please even the most discriminating palate. Guests receive a glass of sparkling wine upon arrival, an appetizer, entree, and dessert and a choice of wine, beer, or a non-alcoholic beverage with the Festival of the Lion King Dining Package. The dining portion will take approximately 90 minutes. Dining Plan not accepted. Theme park admission required. Counts as two Table Service credits for the Dining Plan; not available for the Quick Service plan. Theme park admission required. The unfilled reserved seats are given away prior to show time (sometimes up to 15 minutes before). If you delay entering the theater at the specified time, you may find there’s no seats left. FastPass+ is also available for Festival of the Lion King – you can find out more about that in our guide. The total time for this experience is around 2.5 hours for the Tier Two package and around 3.5 hours for the Tier One package. The Tier One Festival of the Lion King Dining Package essentially includes two FastPasses (the Festival of the Lion King and Kilimanjaro Safaris) thus opening up your FastPass+ reservations for the day.